Browse: Home / odax – Odoo Dictionary Attack XMLRPC tool. odax – Odoo Dictionary Attack XMLRPC tool. The author does not hold any responsibility about the bad use of this script, remember that attacking targets without prior concent its ilegal and punish by law, this script was build to show how resource files can automate tasks. 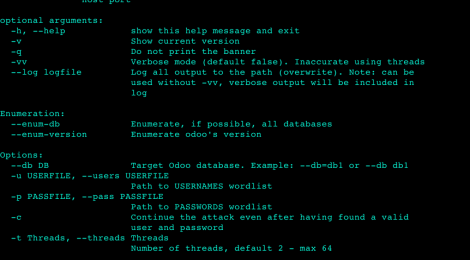 odax is a python script for Odoo Dictionary Attack XMLRPC tool. ← SiGploit – Telecom Signaling Exploitation Framework.